Gift Certificates may be purchased at any time of year. 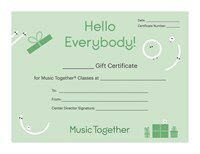 Music class makes a wonderful holiday or birthday gift as well. Give the little music-maker in your life the lifelong gift of music!